Flesh colors Red color outer meat and light color inner meat. 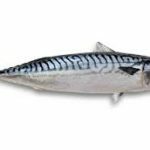 Mackerel is actually a term which is used for different species of fish that belong to the Scombridae family, including Cero, Atlantic, King and Spanish mackerel. This deep water fish is also known as lacento or maccarello. 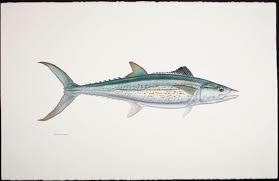 Mackerel can be found in Pacific, Atlantic and Mediterranean Ocean. Although, they are deep water fish but some of them like Spanish mackerel can be found in near the bays as well. They are found in both temperate and tropical seas, mostly living along the coast or offshore in the oceanic environment. 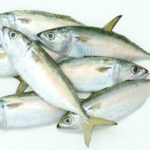 This oily fish can be found in different varieties such as Atlantic mackerel (Boston mackerel), Spanish mackerel, King mackerel (kingfish or cavalla), Cero mackerel (cerro or painted mackerel), Pacific mackerel (American, blue or chub mackerel), Pacific Jack mackerel (horse mackerel) and Wahoo (ono). Mackerel is a slim fish with a cylindrical shape and it has a strong flavor. The slim torpedo-shaped fish is found in deep temperate and tropical waters. These fish are iridescent blue-green above with a silvery underbelly and twenty to thirty near vertical wavy black stripes running across their upper body. It has two widely separated dorsal fins and numerous finlets (small fins) on a dorsal and lateral side of the body. Tail is shaped like fork. The mackerel is known for their oil meat and slim shape. 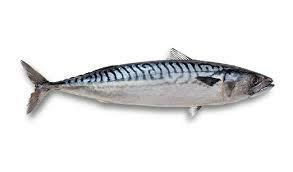 Many of the mackerel’s healthy benefits are derived from its oily meat which contains lots of omega-3 fats. Mackerel is known as a very healthy fish and regular consumption is very good for overall health. 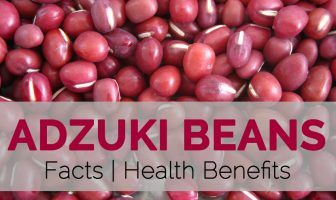 It is famous for the heart health benefits it provides and also, known for making the blood clean and fresh. One should buy mackerel that is firm and bright, gills should be clean and the skin moist with shiny scales. Ideally, this fish should be eaten within couple of days because its skin disintegrates quickly. Mackerel is an important food fish that is consumed worldwide. As an oily fish, it is a rich source of omega-3 fatty acids. 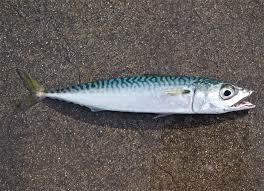 The flesh of mackerel spoils quickly, particularly in the tropics, and can cause scombroid food poisoning. Accordingly, it should be eaten on the day of capture, unless properly refrigerated or cured. The upper surface of Mackerel fish is dark steely to greenish blue, often almost blue-black on the head. The body is striped with 23 to 33 (usually 27 to 30) dark transverse bands that run down in an irregular wavy course nearly to the mid-level of the body, below which there is a narrow dark streak running along each side from pectoral to tail fin. The pectorals are black or dusky at the base, the dorsal and caudal are gray or dusky. The jaws and gill covers are silvery. The lower parts of the sides are white with silvery, coppery, or brassy reflections and iridescence; the belly silvery white. But the iridescent colors fade so rapidly after death that a dead fish gives little idea of the brilliance of a living one. Most of the grown fish are between 14 and 18 inches long; a few reach a length close to 22 inches. 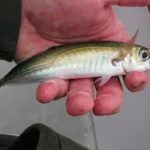 Fourteen-inch fish weigh about 1 pound in the spring and about 1¼ pounds in the fall when they are fat; 18-inch fish weigh about 2 to 2½ pounds; a 22-inch mackerel will likely weigh 4 pounds. An unusually large mackerel is taken occasionally; in 1925, for example, the schooner Henrietta brought in one weighing 7½ pounds. The Atlantic horse mackerel is a species of jack mackerel in the family Carangidae. It gets its common name from the legend that other smaller species of fish could ride on its back over great distances. 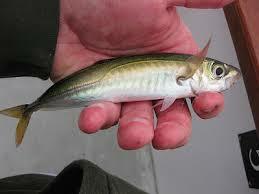 Other common names include European horse mackerel (in the U.S.), common scad, scad, and saurel. Wahoo is a scombrid fish found worldwide in tropical and subtropical seas. It is best known to sports fishermen, as its speed and high-quality flesh make it a prize game fish. In Hawaii, the wahoo is known as ono. Many Hispanic areas of the Caribbean and Central America refer to this fish as peto. The Atlantic mackerel is a pelagic schooling species of mackerel found on both sides of the North Atlantic Ocean. The species is also called Boston mackerel, Norwegian mackerel, Scottish mackerel, or just mackerel. The blue mackerel, Japanese mackerel, Pacific mackerel, slimy mackerel, or spotted chub mackerel is a fish of the family Scombridae, found in tropical and subtropical waters of the Pacific Ocean from Japan south to Australia and New Zealand, in the eastern Pacific (Hawaii and Socorro Island, Mexico), and the Indo-West Pacific: the Red Sea, the Persian Gulf, the Gulf of Oman and the Gulf of Aden, in surface waters down to 200 m (660 ft.). Its length is between 30 and 65 cm (12 and 25.5 in), and weighs a little over 1 kilogram (2.2 lb.). , mackerels, and bonitos, and the butterfly kingfish. Scomberomorini comprises 21 species across three genera. 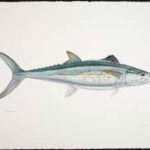 The Pacific jack mackerel (also known as the Californian jack mackerel or simply jack mackerel), is an abundant species of pelagic marine fish in the jack family, Carangidae. The species is distributed along the western coast of North America, ranging from Alaska in the north to the Gulf of California in the south, inhabiting both offshore and inshore environments. 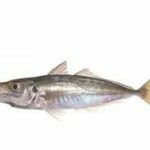 The Pacific jack mackerel is a moderately large fish, growing to a maximum recorded length of 81 cm, although commonly seen below 55 cm. The chub mackerel, Pacific mackerel, or Pacific chub mackerel is a mackerel which closely resembles the Atlantic chub mackerel. The Indian mackerel is a species of mackerel in the scombrid family (family Scombridae) of order Perciformes. It is commonly found in the Indian and West Pacific oceans, and their surrounding seas. It is an important food fish and is commonly used in South and South-East Asian cuisine. The Pacific sierra also known as the Mexican sierra, is a ray-finned bony fish in the family Scombridae, better known as the mackerel family. 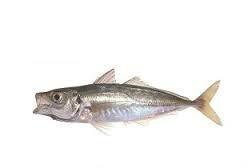 More specifically, this fish is a member of the tribe Scomberomorini, the Spanish mackerels. The short mackerel or shortbodied mackerel is a species of mackerel in the family Scombridae. Its habitat is the shallow waters of Southeast Asia and Melanesia, feeding mainly on small zooplankton. It is of major importance in the fisheries industry. The Australian spotted mackerel is a species of fish in the family Scombridae. Common fork length ranges between 50 to 80 cm. Specimens have been recorded at up to 104 cm in length, and weighing up to 10.2 kg. It is found in the western Pacific, along the northern coast of Australia, from the Abrolhos Islands region of Western Australia to Coffs Harbour and Kempsey in central New South Wales. Apart from their mild taste and strong flavor, mackerel fish is a good source of nutrients, vitamins and minerals. Consuming 88 gram of mackerel fish offers 16.72 µg of Vitamin B-12, 45.4 µg of Selenium, 15.67 g of Total Fat, 20.99 g of Protein, 6.028 mg of Vitamin B3, 245 mg of Phosphorus, 0.405 mg of Vitamin B6, 0.363 mg of Vitamin B2 and 85 mg of Magnesium. Moreover many Amino acids 0.235 g of Tryptophan, 0.92 g of Threonine, 0.967 g of Isoleucine, 1.705 g of Leucine, 1.927 g of Lysine, 0.621 g of Methionine and 0.225 g of Cystine are also found in 88 gram of mackerel fish. One of the most effective methods to prevent heart disease is to consume diet containing good amounts of omega 3 fatty acids. Mackerel fish is not only rich in monounsaturated fatty acids and polyunsaturated fatty acids but also is also low in saturated fats. Hence frequent consumption of this fish helps to lowers your risk of heart complications like stroke, atherosclerosis, heart attacks and arrhythmia. Mackerel consists of good amount of healthy fats namely monounsaturated fatty acids (MUFA) which play a key role in the prevention, as well as control of blood sugar levels in diabetics. Consuming this fish on a regular basis not only controls blood sugar levels in the body, but it also lowers visceral fat, thus lowering your risk of diabetes. 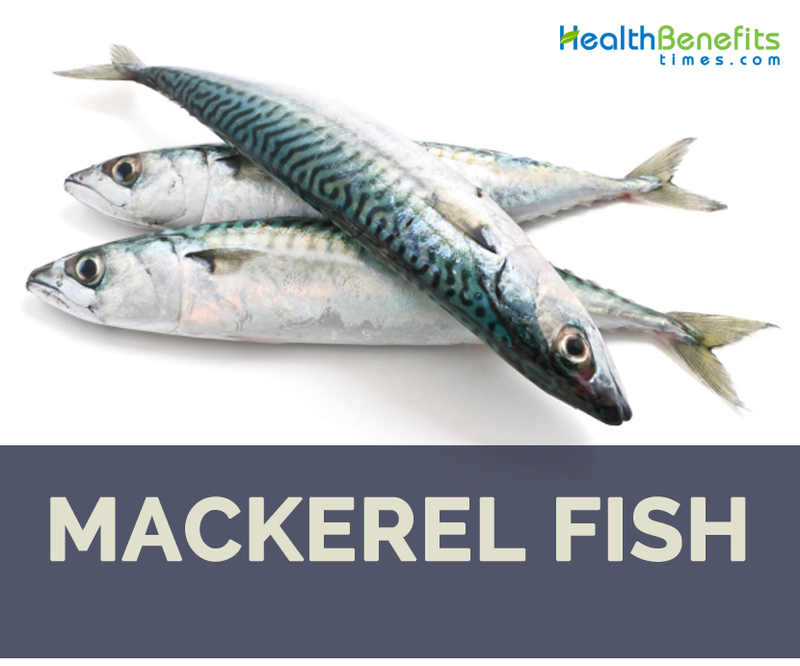 In case you are a non-vegetarian by nature and suffer from hypertension, consume mackerel fish on a daily basis to keep your blood pressure levels within control. High levels of potassium present in this fish helps in maintaining normal blood pressure in addition to lowering the risk of health complications associated with the condition. Mackerel consists of anti-inflammatory compounds which help in lowering the joint pain and stiffness of muscles in people suffering from rheumatoid arthritis. Including this fish in your diet while on medication is found to improve your condition by enhancing the efficacy of the drugs. Mackerel fish is rich in coenzyme Q10, antioxidants, and omega-3 fats. Coenzyme Q10 help get rid of cancerous agents attached to cells; antioxidants can help lower risks of cancer by eliminating free radicals in your body; omega-3 fats can help prevent breast, prostate, renal and colon cancers. 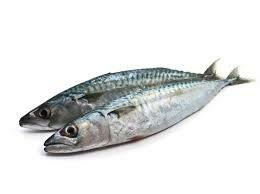 Apart from that mackerel fish is also rich in vitamin B12 and selenium that are helpful in treating cancers. Content of omega 3 in the puffer fish is believed to help people lose weight. Research has shown that regular consumption of fish oil bloating combined with regular exercise can reduce abdominal fat expressively. It can also help regulate the body’s metabolism, and can help reduce blood sugar in overweight people. Fish oil found in mackerel helps lower your bad cholesterol particles, and increase your good cholesterol levels. The fish oil works by preventing cholesterol from being absorbed in the intestine, which at the mean time can also help lower blood pressure. Research studies have proved that people consuming high levels of omega-3 fatty acids are at a lower risk of getting affected by depression. Therefore, by adding mackerel to your daily diet, this food not only aids in reducing mood swings common in individuals suffering from depression, but it also improves the activity of antidepressant medications. 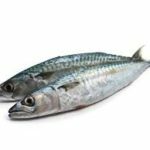 Mackerel is overloaded with DHA (Docosahexaenoic acid) and consuming this fish lowers your chances of suffering from Alzheimer’s disease and Parkinson’s disease. Mackerel can be baked, broiled, pan fried, poached, and grilled. Mackerel cooks fast and easily. Marinating it in the refrigerator increases its flavor and taste. Mackerel can be used along with other combinations to add to its taste. One such combination is flaked smoked mackerel, apple and chive pate. Mackerel is known to make a person’s blood fresh by working as a blood purifier and thinner. It offers better functioning of the heart, thus preventing cardiovascular disease. It strengthens the immune system and provides support to the organs’ functioning which has become weak due to illness. It improves brain activity and increases the memory capability. It works in reducing the LDL and helps in lowering the blood pressure. It is helpful in bringing relief during pain in arthosis, arthritis, and Migraine. It works in regulating the hormone level and in bringing elasticity to the capillaries and blood vessels. It helps in eliminating cancer causing agents in cells. Mackerels are carnivores (meat-eaters). Their diet consists of copepods, small fish, shrimps and squids. They are diurnal animals (active during the day). They are fast and agile swimmers. They can swim at the speed of 5.5 meters per second. They have numerous natural enemies. Tunas, whales, dolphins, sea lions, sharks, tortoises and pelicans often consume mackerels. It migrates toward the shallow water (close to the shore) during the spring, when mating season starts. 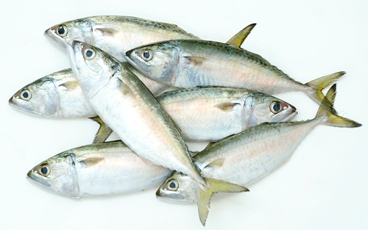 Mackerels have long lifespan. They can survive up to 25 years in the wild. The eyes of fresh mackerel appear bright and clear. The gills should be clean and the skin moist, with tightly adhering, shiny scales. Select mackerel that is stiff and does not bend by its head or tail. While purchasing mackerel fillets or steaks, select the ones with moist, translucent flesh. While storing mackerel, eliminate it from the packet and wash well under cold water. Pat with paper towels and pace it on a cake rack, in a shallow pan filled with crushed ice. Cover with a foil and refrigerate in the coldest part. Wrap the mackerel well and store in the freezer for 2 months or deep-freeze it for 3 to 4 months. To melt the fish, wrap and place it in a pan, uncovered. Leave it in the refrigerator for 24 hours. To get a strong taste, marinate the mackerel with a citrus or vinegar marinade, for 15 to 30 minutes. To bake mackerel, place it in a greased baking dish. Brush with some oil or butter and season with salt and pepper. Bake in the oven for about 10 minutes, at 450 °F (230 °C), until evenly cooked. Mix together flour, crumbs and cornmeal. Coat the mackerel fillets with this mixture and place on the rack above the baking dish, 3 to 4 inches away from the element. Brush with melted butter or oil and broil for about 3 to 10 minutes, till the fish gets moist in the center. Combine mackerel with seasoned flour, crumbs or cornmeal. Fry the fish in hot butter or oil. Cook on both sides until opaque and moist inside, say for about 4 to 8 minutes. Since mackerel contains methyl mercury, pregnant women and nursing mothers should avoid it. 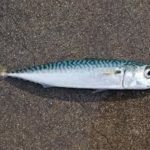 Mackerel should not be consumed regularly by pregnant women, otherwise it harm a child’s developing nervous system and pose risk to mothers as well. Calories 231 Kcal. Calories from Fat 141.03 Kcal. Calories 230 Kcal. Calories from Fat 140.04 Kcal.